Obituary for Rev. Frank Orrin Brown, Sr.
Rev. Frank Orrin Brown, Sr.
Rev. 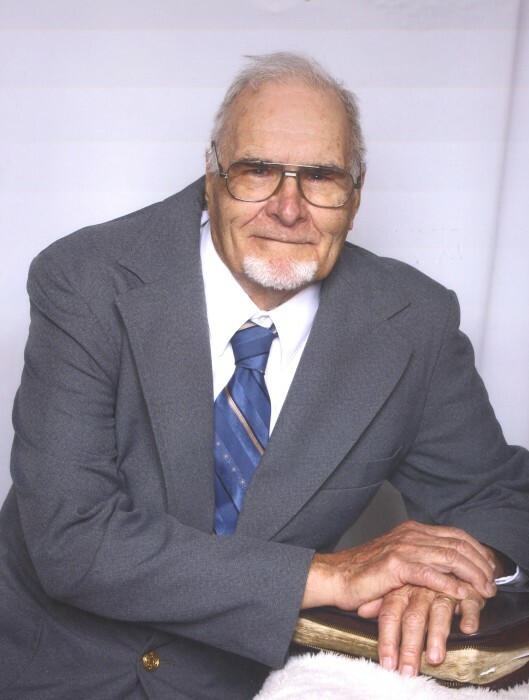 Frank Orrin Brown, Sr., age 94, of Morrisville, PA, went home to be with his Lord on Friday, April 12, 2019 at St. Mary Medical Center, Langhorne, PA, with his family at his side. Born in Meridian, Oklahoma, Rev. Brown was a WWII Vet, Pastor, prayer warrior, “Rawleigh man,” author, beloved husband, father of 5 and affectionately known as Poppop. He raised his family and ministered in Derby, Vermont for over 20 years and then moved to “south-country” in East Arlington, Vermont for the next 32 years. In 2012 he moved to Morrisville, PA near his eldest daughter. As a proud Navy Veteran of WW II, Frank served on a ship in the Pacific Theater as an engine mechanic. Upon his discharge from the Navy at Philadelphia, he attended Philadelphia School of the Bible, met and married his wife, Lois, and then graduated from Reformed Episcopal Seminary, also in Philadelphia. Having bought a house from Levitt in Levittown and after having 5 children, he received a call to be the Pastor of the Derby Bible Baptist Church in Derby, Vermont, and served there from 1960-1980. During his time in both northern and southern Vermont, he also worked as a door-to-door salesman with W.T. Rawleigh Company, utilizing that opportunity to serve the Lord and often held Bible studies in customers’ homes. Rev. Brown was a member of the Independent Fundamental Churches of America (IFCA) He was known for the many bulletins he wrote on various Bible subjects and for regular contributions of letters to the editors of many local newspapers, and helped start new plants and reopen closed churches. In His later years he authored a book entitled “Footprints of the Creator,” which is still available for on-line purchase through Amazon. Rev. Brown was also an avid gardener, well known for his extensive gardens and providing neighbors with fresh produce. Frank is a son of the late James O. and Linda Esther (Cochran) Brown, and husband of the late Mildred Lois (Friday) Brown to whom he was married for over 50 years. He is survived by three sons and a daughter in law, Frank Orrin Brown, Jr. of Bennington, VT, Roy and Peggy Brown of Southbridge, MA, and Edward Lee Brown I of Amsterdam, NY., as well as two daughters and their husbands, Lois and the Rev. Gary Taylor of Morrisville, PA and Laura and Philip Wheeler of Abilene, TX. He is predeceased by his wife, M. Lois, two brothers and a sister, David, Loyal, and Mae, and his half-sister, Marian and is survived by a sister and brother-in-law, Alice Joy and Earl Holtschneider, of Guthrie, OK, 15 grandchildren, 25 great-grandchildren, and many nieces and nephews. Relatives and friends are invited to attend his funeral service at 11 AM on Monday, April 22, 2019, at the First Baptist Church of Morrisville, 50 N. Pennsylvania Ave., Morrisville, PA. The Rev. Gary Taylor, Pastor and son-in-law of the deceased, will officiate. Frank’s interment will be held on Tuesday, April 23, 2019 at Evergreen Cemetery, Cemetery Rd., Arlington, VT at 12:00 pm. Friends of Frank and Lois Brown are welcome to join the family for a graveside ceremony. Friends may call Monday morning from 10-11 AM at the First Baptist Church. Arrangements have been entrusted to the care of the J. Allen Hooper Funeral Chapel, Morrisville, PA.